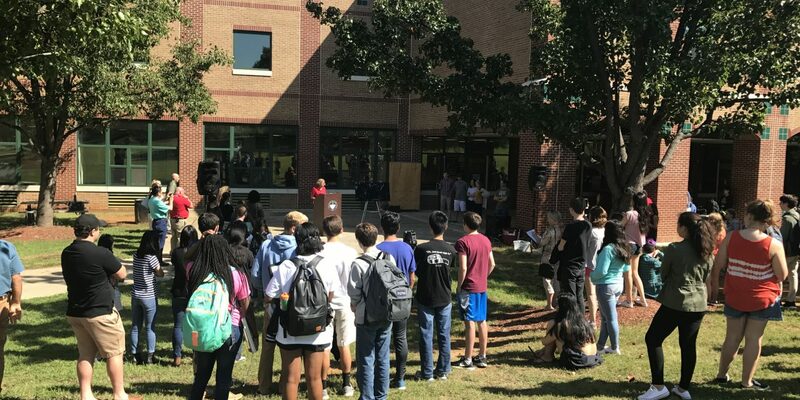 East Chapel Hill High held a Solar Kickoff event last Wednesday to celebrate their winning a grant to install solar panels at the school. The $300,000 grant was awarded to the school and seven other schools in the state by Duke Energy with the help of Raleigh-based nonprofit NC GreenPower. Outside of generating renewable energy for the school, the program will also serve as an educational tool for students, which Chapel Hill – Carrboro City Schools Superintendent Pamela Baldwin believes is of utmost importance. The initiative is modeled after NC GreenPower’s Solar Schools program and will pay for the entirety of the installation costs. It will also provide monitoring equipment, training and curriculum to students and teachers. Chapel Hill Mayor Pam Hemminger applauded the students’ hard work and involvement in the initiative. Duke Energy’s clean energy initiative was part of a recent settlement with the U.S. Environmental Protection Agency and environmental groups.